Recently we were invited to a Christmas party. The host didn't assign or ask for specific items, so I came up with this savory appetizer. 1 packet taco seasoning, I used homemade taco seasoning. Combine the chips and butter and press into the bottom of a 9-inch springform pan. Combine the ricotta cheese, cream cheese, eggs (added one at a time), cheddar cheese and green chilies in a food processor until blended. Pour into the springform pan and bake until it sets, about one hour. Remove from the oven. Let cool. 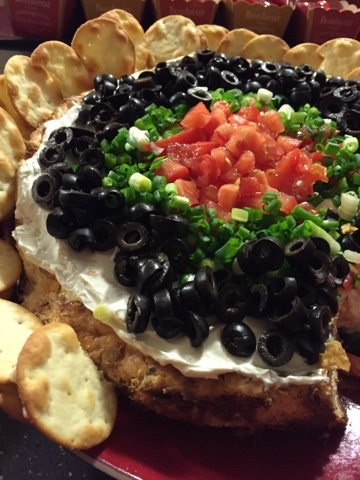 Mix together the sour cream and cheese dip, and spread over the cheesecake. Cool at room temperature for one hour. Before serving, sprinkle the top with the tomatoes, black olives and green onions.